The new review dropdown on the top-bar is a great addition. One thing I noticed, the numbers only refresh when you reload the page. If you spend some time on a page and then click the review button to open the dropdown, the counts shown will completely differ from the amount of items actually in the queue at that current moment. 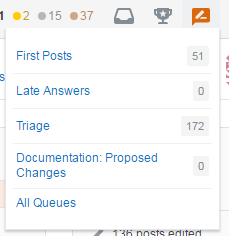 When I first loaded the page shown in the above picture, there were 51 items in the first posts queue, and 172 items in triage. I then spent a bit of time on the page and then clicked the review button and opened the dropdown. At that point there were really way less review items in the first posts queue. There also were now some items in the documentation queue, but that still showed 0. As soon as I refreshed the page, I saw the correct new numbers. Shouldn't the numbers load when you click the review button instead of on page load? As @TinyGiant pointed out, the list gets loaded the first time the button is clicked, rather than on page load. I didn't realize this, so this problem is less likely to occur than I thought. It will only happen if a user clicks on the review button, closes the menu, and then clicks on it again, rather than just clicking on it once and going to a queue. This does happen though, so it still would be better if the counts are as up-to-date as possible. Having more up-to-date counts will help users see which queues are in most need of some attention. It also will prevent users from ignoring queues that say 0 when the count is really greater. Obviously, the numbers can change between the time you click on the review button, and when you actually click on one of the dropdown items to go to a queue, but that change wouldn't be as drastic as if you would click on the review button, and later, click on it again. Browse other questions tagged bug review top-bar .